Recently, my mom had to go to a business meeting and needed to bring refreshments, preferably of the sweet variety. I, of course, was commissioned to make these for her. My mind immediately started coming up with lavish ideas, but all of these were ruined when I learned that one of the people attending this meeting needed them to be gluten free. No, they did not have an allergy they decided to go gluten free for a couple of months to see how it would work as a diet or whatever. I do not under stand this- why would you willingly not eat gluten? No bread? No cupcakeS? No brownies? No cookies? No croissants? I would not be able to do it. Only a couple days before I made these, my dad had a flourless chocolate cake on one of his trips and requested that I make one for Father's Day. I was INCREDIBLY skeptical- a layer of chocolate cake, without flour, with some powdered sugar on top? I already had plans in my head of just happening to forget (although I would never do that. Forget or pretend to forget- not on Father's Day). But because of these gluten free people, I succumbed to making these. I figured I would at least try some before Father's Day. And my entire outlook on the world changed. Okay, maybe that's a little exaggerated. But I was extremely and pleasantly surprised- these things are GOOD. Like almost better than normal chocolate cupcakes. Not having flour in them makes them incredibly rich, and moist, and Joy the Baker's chocolate frosting on top just completed it. Speaking of which, this frosting was perfect for my new frosting tips- don't they just look so adorable? With just their little dollop of frosting perfectly curled off? I could just gobble them right up. In a microwave-safe bowl, combine the butter and chocolate and melt in 30 second increments until the butter is completely melted. Whisk until the chocolate is also melted, and mixture is smooth. Whisk in the brown sugar, then eggs, until smooth. Sift the cocoa powder and espresso powder into the mixture, and mix until combined. Bake until the tops are set, about 15 minutes. Let fully cool before frosting. Cream together butter, cocoa powder and salt. Butter mixture will be very thick. Turn off the mixer, scrape down the sides of the bowl and add powdered sugar. Turn mixer on low and mix in powdered sugar while adding milk and vanilla extract. As the sugar incorporates, raise the speed of the mixer to beat the frosting. Beat until smooth. In a 1-cup measuring glass, stir together heavy cream and Ovaltine. Turn mixer speed to medium and pour cream mixture into frosting in a slow, steady stream, until you’ve reached your desired consistency. You may not need the full amount of Ovaltine and cream. Spread or pipe onto cupcakes. Yuuuuuuuuum!! Yep! Everyone at the meeting loved them too! Haha, I love how you put that frosting on everything now! 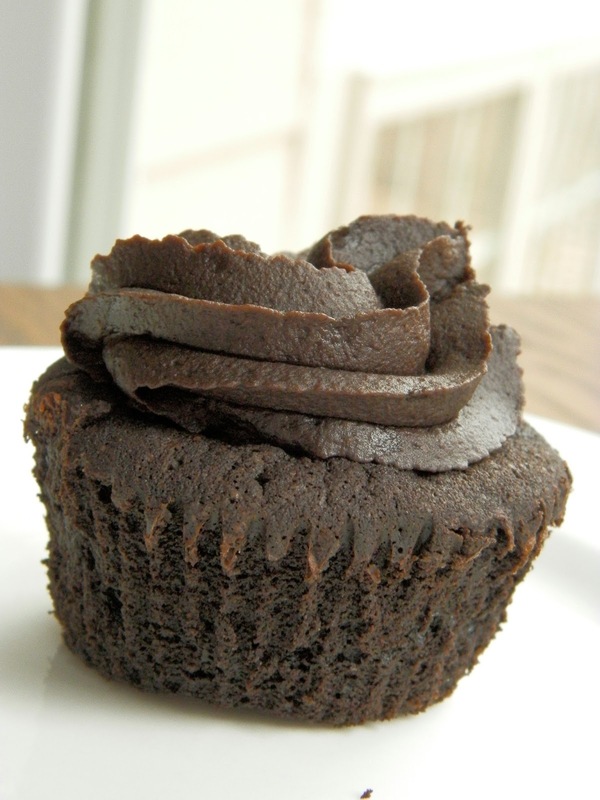 It really is the best chocolate frosting ever!